When you are writing your next book you are either laser focused or having a major panic attack over getting it written. If you are like me it is the later. 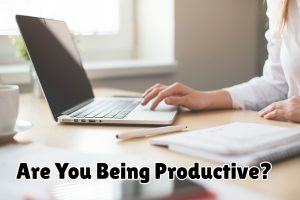 One thing that has helped me is tracking my productivity. I have both a calendar notebook and I keep a record in Evernote software. Must have tried 1000 apps but I keep going back to my trusty pen and paper. I use Evernote to keep short bullet list of things to do and the notebook as more of a day so I can see what works and what doesn’t. While this system may seem redundant it is what is currently working for me. The bullet list in Evernote will have things like “Started Facebook ad” and the notebook will have a detailed results of that ad. Why this works for me is because at the end of the week I can go in and look at my bullet points and then open the notebook and see what is working and more importantly not working. There is a blog post that I wish I wrote over on the Zapier blog about productivity. Even if you adapt a small part of this you will see your workflow become much more focused. Do you have a better system that you like?